This won’t come as a surprise: AU’s top three majors are International Relations, Political Science and Business Administration. If I try to sum up our university in one word, I instantly think of adjectives like “passionate,” “forward-thinking” and “intelligent”. Our school truly shines in the social sciences through the incredible work of our students and professors. Each year, the bar is set very high through the work done in and outside the classroom. But when was the last time you have spoken to a science major about their experience as a student at AU? This year, I would like to see the University celebrate its STEM students and professors. It is not difficult to find extracurricular outlets and ways to gain recognition through hard work as a student of the social sciences at AU, but as a physical science or technology student the opportunities are few and far between. We rightfully celebrate our world renowned IR program but unfortunately our STEM students are stigmatized for their choice of major. Many times I have heard my fellow science students scoffed at for choosing AU because it is not “a science school.” Why can’t we be? We have the resources necessary to be a truly great school for both social and physical sciences: incredible professors that often go unrecognized and motivated students that want their studies to feel as valued at AU as poli-sci or IR students. This year, I invite the AU community to contemplate how we could better ourselves as a university by valuing an often unrecognized corner of our campus: the students and professors of STEM. Olivia Richter is a junior in the College of Arts and Sciences. Perhaps the most anxiety-inducing part of the college application process is financial aid. For many students those numbers decide where you go to school and often how long you stay there. Unlike during the application process, returning students do not have a Common App or guidance counselor to walk them through the financial aid process. If you don’t have a parent who went to college and is already familiar with these forms, the process of applying for financial aid can be daunting. This can cause students to skip important parts of the process, such as the FAFSA, causing them to disproportionately increase their loan intake. Private loan companies like Sallie Mae target those students who lack financial literacy, especially first-generation college students. These students, unaware of their financial options, accept parasitic loans which limit their ability to refinance and hinder their ability to achieve economic stability after graduation. In order to combat this perpetuation of classism within the financial aid system, schools like AU should provide individual financial aid counselors to students rather than general financial aid assistance. Much like an academic counselor, these professionals would walk students through their different options concerning their finances and ensure that they make the best decisions for their futures. If students have to take on another job or cut down their class schedule in order to accommodate work over other aspects of their lives, such as their mental health or academics, they may suffer. Student Government should introduce an initiative that works to make the financial aid process more accessible to students who do not have access to any other resources. Professional financial aid counselors would be a great way to ensure that students are aware of their options before they make any decisions regarding their financial future. It is important that students feel supported and informed in all aspects of their education, especially regarding their economic stability. Julia Gagnon is a sophomore in the School of International Service. There is a plague in this country. It attacks the minds of Americans viciously, and without discrimination. The method of entry varies, sometimes infecting naïve, concerned citizens through their ears or often through their eyes. However, the disease always makes its way to the brain. It is wildly contagious. As students at one of the most politically active schools in the nation who may want to undertake the noble cause of being a future problem solver for this world, we may want to start by reflecting on this problem. The agents of this plague are your closest friends. It is the pastor at your church. It is your high school history teacher. It is your grandpa. It is your middle school crush who now does nothing but post George W. Bush memes on Facebook. They are Anderson Cooper, Megyn Kelly and your local nightly news anchor. “What is the plague?” you may ask. The plague is unfettered bias in political conversation and misrepresentation of facts. We who have made the conscious decision to attend college in the nation’s capital must demand a higher level of discourse. We must criticize, fact-check and scrutinize every statement that comes out of the mouth of those with whom we disagree. That goes double for those with whom you agree. This year, let’s make it our mission as fellow Eagles to open up the floor. Last year at AU, I truly believed that I found a place I could call my home away from home. I love this school and could not be prouder to attend. However, I was disgusted by one issue that came not only to the forefront of campus life but also appeared in the national spotlight. In February of last year, an AU student pursued sexual assault charges through the school’s student conduct process. Allegedly, the school forced this individual to sign a confidentiality agreement during their disciplinary hearing. Since the national spotlight shined on this case, AU has changed its protocol in regards to making an individual sign a confidentiality agreement. However, the fact that this needed to become an issue in order to make the change is unacceptable. Rather than apologizing for forcing a survivor to stay silent, a member of the administration complained that the survivor “didn’t need to file a complaint.” The University did not give steep enough punishments to the perpetrator, therefore justifying the survivor’s decision to take matters into their own hands. These events prove to us that the system still has a long way to go, but policy changes are certainly a step in the right direction. Alexander Zipper is a sophomore in the School of Public Affairs. As we return to the District and move out of our messed up sleeping schedules and shake ourselves out of that summer grogginess, there are some issues that should be on our radars. Whether living on campus or not, what happens on our campus affects us all. It is our responsibility as students, neighbors, friends or just frequent passer-bys to ensure that this environment is a safe space for all people. Let’s be clear: regardless of anonymity, derogatory comments that could threaten the safety of any marginalized group are unacceptable. Last year, during my freshman year, AU students abused Yik-Yak’s anonymity at least twice. While campus groups like The Darkening helped to expose the atrocious, racist and backwards comments expressed by fellow students, there is always the possibility that this will happen again. In addition to the explicit racism, blatant levels of disrespect were channeled toward our trans community when Milo Yiannopoulos raised hell last spring. Because the “outside world” away from campus is not tolerant toward Black people, trans people, Muslims and any other group deemed “different,” we must start making changes at the local level. In order to prevent and, if necessary, appropriately handle incidents like these, we should follow The Darkening’s model, and hold each other accountable. When we do so, the administration takes note. Change brews even at the lowest level of the authoritative pyramid and that means it starts with us. This school year, we must continue to strive to make our campus a safer and more accepting climate for marginalized groups. Shelby Moring is a sophomore in the College of Arts and Sciences. Remember when you were walking around as a freshman trying to figure out where your classes were? Did you ever stumble across a building on your schedule that you didn’t know where it was located? I remember going through this experience myself as a freshman in finding where the Asbury building was located. To find where it was, I asked an AU student on the quad. At the time, the instructions to get to Asbury were confusing to me but eventually I knew my way to Asbury by heart. With Welcome Week and the start of classes upon us, I reflect on this experience and realize that our campus is in desperate need of more basic permanent signage directing students and visitors in the to campus buildings. Go to any part of campus and look around you. Do you see any signs directing you towards the Financial Aid Office, the Provost’s Office, the Student Health Center or Public Safety’s office? Absolutely not. The lack of signage makes it harder for not just incoming students to navigate around campus, but also transfer students and current AU students who may have never had a class in a distant campus building such as Kreeger or Watkins. This is a disservice to students. The administration should think about how the lack of easily available directions appears to prospective students. When looking at college campuses, prospective students and their families consider how easy it is to navigate around a college campus. I fondly remember visiting a few college campuses and noting how they had signage pointing me in the direction of key academic buildings and the student union. If a sign can exist outside the AU Abroad Office pointing students in the direction of key global capitals and how far they are from AU, then there can definitely be signs pointing students and visitors in the direction of the AU Abroad Office itself. Urging Student Government or the university administration to consider establishing permanent signage is not just an investment in the daily lives of the current student body, but future ones to come. “Journalists are the lowest form of life,” Donald Trump proclaimed to supporters at a rally on Aug.12. The candidate and his surrogates have stepped up rhetoric against the “crooked media” as of late, although media criticism has been a major point of Trump’s campaign from the very beginning. Often a candidate’s demeanor and character during the campaign is a good indication of their potential presidential conduct. Trump is essentially asking nervous observers of this anti-journalistic behavior to ignore how he treats the media now and to trust that a Trump administration would be just as transparent with the press as expected of any modern president. He utilizes name calling for news organizations just as much as he does human opponents—the “failing New York Times” among his favorites. His messages to supporters about the media are perhaps even more troubling than his public rhetoric. Mass emails sent by the campaign claim that Trump has fallen victim to a Clinton media machine that stretches from the New York Times to CBS. Citizens must reject Trump’s attack on the media—the right of a free press is absolutely essential to our system of government. It keeps officials in check when the government itself cannot. Trump’s statements are troubling at the least, downright dangerous at the most. Kris Schneider is a sophomore in the School of Communication. The Eagle welcomes opinion pieces from students, faculty and staff of American University. Please send your submissions of 500 - 800 words to edpage@theeagleonline.com. 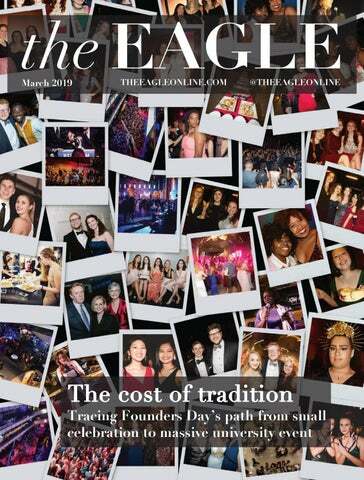 Any inquiries may be sent to Naomi Zeigler, Opinion Editor, at nzeigler@theeagleonline.com.